Let's get serious for a moment.... is it possible to not love a bit of ombre? Really though, who doesn't like it? 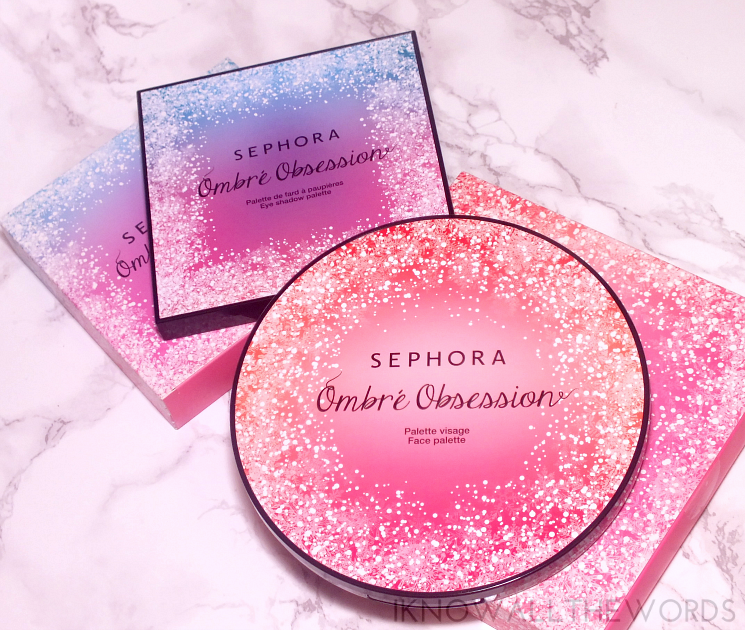 Sephora Collection knows where it's at and have added the effect to two new, limited edition palettes. 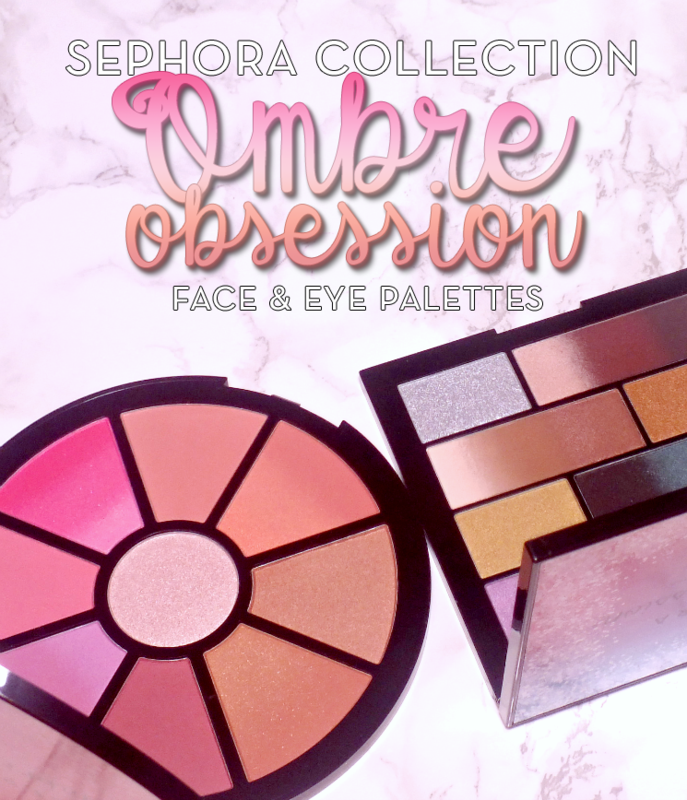 The aptly named Ombre Obsession Face and Eyeshadow palette are not only fun to look at, but are also filled with some great product. Want a closer look? I know you do. Read on! Of the two palettes, the Ombre Obsession Face Palette is the largest with an impressive nine blush/bronzer shades and a highlight. 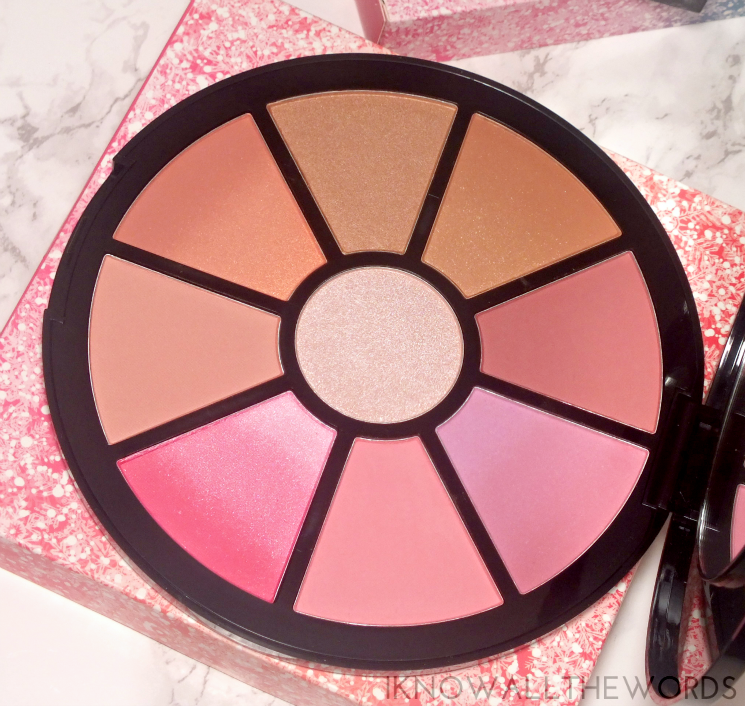 The round palette is clad in a very cute wintery design on pink ombre (of course.) The palette is pretty big, bigger than my palm, but smaller than a dinner plate, and includes a half size mirror in the lid. When you open that lid, you're greeted to an array of pretty shades with four ombred options, four single shades, and the highlight in the centre. While the textures and pigmentation does vary a bit from shade to shade, pretty much all of them performed really well. Most shades have some sort of shimmer or a satin finish, but there is no glitter or anything unwearable. 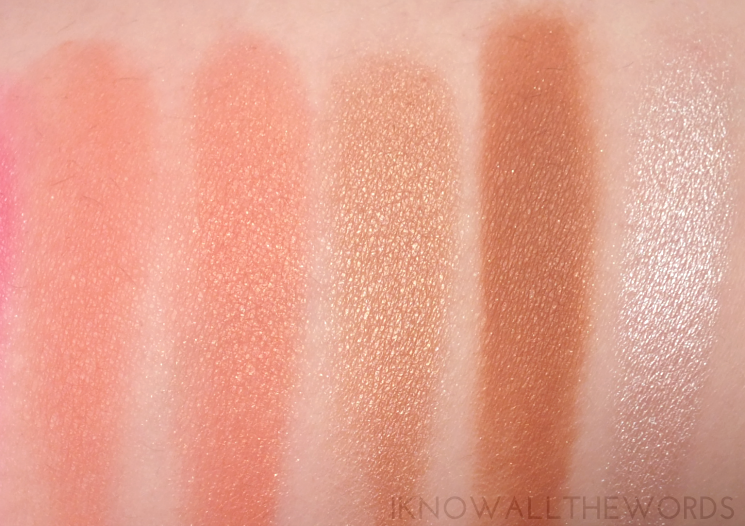 The only shade I found to be a bit lackluster was the neutral-peach shade (first shade in the second set of swatches) as it was pretty sheer and needed to be built up. While I can see myself using every shade, shades of note include the ombred orchid shade (second shade in first set of swatches) as it's just such a pretty shade that blends a pinky hue with a lavender. The third ombre shade, a pinky-peachy-gold (second shade in second set of swatches) is stunning, and not unlike another beloved shade, Milani Luminoso. The centre highlight has a fairly neutral look in the pan, but leans a bit more pink in tone when swatched is a stunner! The shade is meant to be universally flattering (which I would say it is) has a gorgeous, radiant luminosity and packs a ton of pigment. 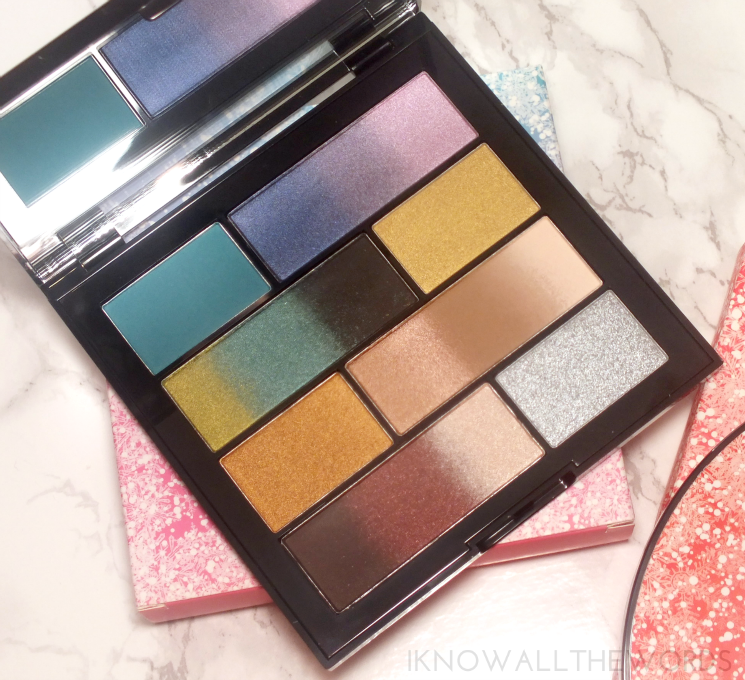 Eye weren't left out of the ombre fun, and have their own Ombre Obsession Eyeshadow Palette. 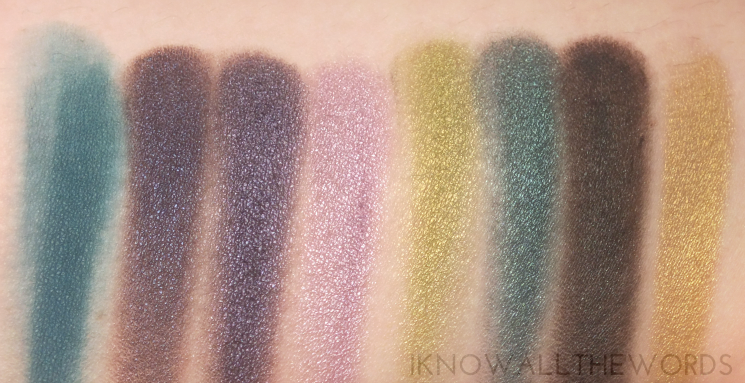 The shadow palette has the same wintery design (on an ombre background, obviously) but is smaller in stature than the face palette. The square palette does boast a larger mirror though, as it fills the whole of the lid. 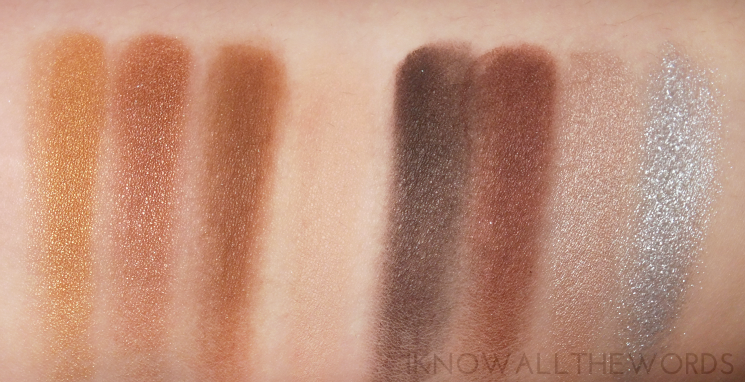 Like the face palette, not every shade is ombre, but four larger shadows have the effect while four don't. Overall, the shadows are excellent. While the textures and finishes do varry, there were only three shades that didn't perform as well as I would have liked. The darkest shade in the second ombre shadow (the greens) had a stiff texture that picked up well on my finger but just did NOT want to transfer onto my arm. The light beige-pink in the first brown ombre shadow was quite powder, and while it feels very soft, it just disappears on skin. Teh silver shade, was initially a dud for me as it seemed chunky, and to be more glitter than anything of substance, but upon further inspection, it seems to have a glitter overcoat (or overspray.) The shadow underneath seems to be much smoother and wearable. I initially wondered how useable the ombre shadows would be, but they;re large enough to get each individual shade on a brush and the quality is pretty great. I'm impressed that they were able to create such a pretty effect and mix shadow textures in one pan. Overall, these are both palettes worthy of space in your collection! Granted, there are the odd shades that aren't perfect, but that's usually the case with palettes. 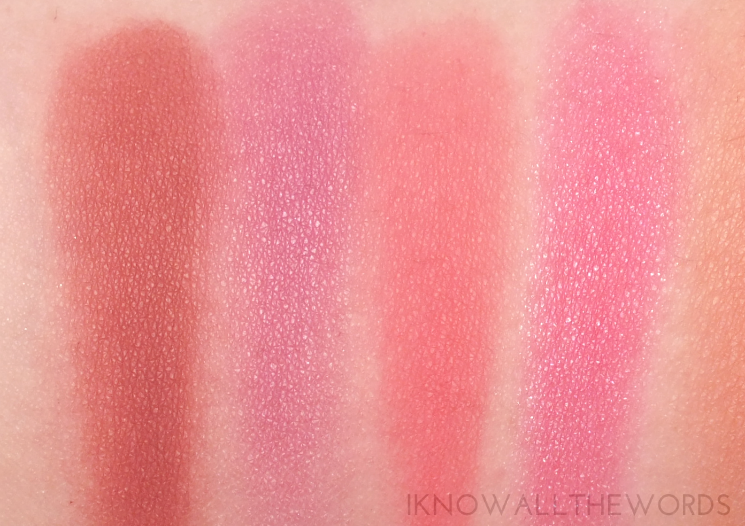 Of the two, I think the face palette is my favourite because, well, blush, but the shadows do have a certain appeal. What do you think? Are you an ombre fan? Need these palettes?